The passage from Barbeau’s book that begins Abel’s poem focuses on a totem pole on the Nass River, in the territory of Abel’s Nisga’a ancestors. This poem engages with Barbeau’s ethnographic view of Abel’s own community. Through this blending of perspectives and motivations, Abel blurs the lines between the ethnographic subject and its supposedly objective observer. The title of the poem, however, also offers a glimpse of Abel’s conscious engagement with the colonial and ethnographic ideas that limited Barbeau’s writings. The title emphasizes a silhouette rather than a detailed description of the totem pole, suggesting that Barbeau did not fully understand what he was seeing. Furthermore, Abel hints at Barbeau’s limited engagement with the richness of the Nisga’a community due to his fixation on a singular material object. Figure 1: The second page of Abel’s poem, as printed in Canadian Literature , showing bleed-through from first page. Jordan Abel, 2013. Abel uses erasure strategically to reinterpret Barbeau’s rigid prose. 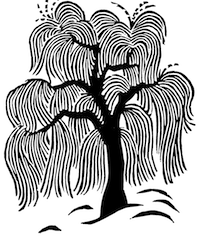 Abel erases all the English language text first, leaving only the Nisga’a words, and then washes them away too, leaving only brackets, rippling on the page like the river beside the silhouette of the pole. 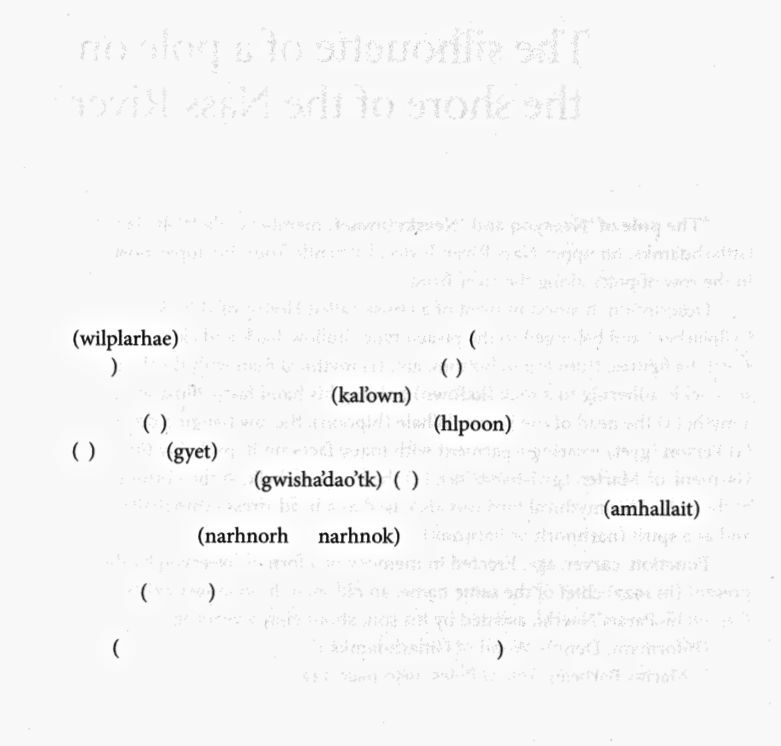 Note that in print, the first and fourth pages bleed through the paper (see Figure 1), offering hints or ghosts of the obliterated terms, heightening the impression of erasure. However, Abel then reconstructs a single sentence, glimpsed and pieced together from a series of parenthetical insertions, that offers, perhaps, an ethnographic observation: “field / process wherein / language readjusts to / casualty // a description of / all” (14). While fragmented and somewhat incoherent, this scattering of words may suggest how language readjusts in the inter-cultural space of ethnography, which may cause descriptive “casualt[ies]” through its limitations. The final page of the poem returns to coherent prose, filling in the blanks of the previous page, and tells of a scene involving the totem pole, Barbeau’s notebook, and his Nisga’a “informant” Dennis Wood, who taught him about the pole. The word “informant” is no longer in favour with many anthropologists, as it reduces Indigenous collaborators to fact providers, although without their work and cooperation, no anthropologist could have produced anything at all. The first page of the poem produces the style of an ethnographic report. The last page tells of the human relationships and emotions that these reports never mention. The distance between these two styles marks one of the ways in which scientific writing reduces human beings to objects of study. Quotation (page 11): What type of language and style does Barbeau use in his write-up about the totem pole? What kind of perspective on this cultural artifact does Barbeau present? What types of details about the surrounding community and culture might be missing? Dissolution (pages 12–13): In what ways might the first three pages offer a narrative about the limits of language and translation? How much understanding of the Nisga’a culture is really coming through Barbeau’s writings? Reconstructions (pages 14–15): How does the personal style of the final page adjust our understandings of Marius Barbeau and his interactions with his informant? For instance, notice how the character of Barbeau on page 14 assumes a patronizing and authoritative role in his interactions and assumes himself to be the centre of his informant’s story. The prose on page 14 also reveals more details, and in a more interpersonal manner, but with the Nisga’a language fully absent. How does this scene reconstitute the objective notations of the opening one, and clarify why the pole is but a silhouette to Barbeau? 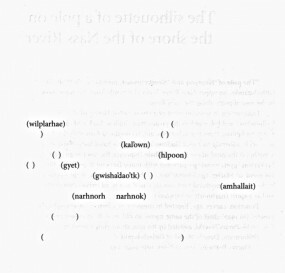 The visual-prose poem: The slow dissolving and reconstituting of a block of text over the course of the five pages of the poem reflects a transformation—but what is transforming? Is it the various representations of the pole itself or Barbeau’s perspectives on it? Consider how the transformation could connect to wider perspectives, such as those of the Nisga’a, or to wider settler-Indigenous relations. What might this poem be saying about the Indigenous-ethnographer relationship and its associated documents and histories?